Looking for a simple, yet effective way to store your AED? The Perspex AED Armor range could be exactly what you’re looking for! 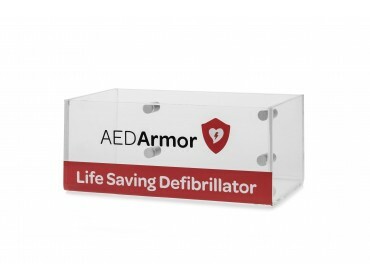 Sleek and sturdy, the Large Perspex Wall Box has been designed with all AEDs in mind, so regardless of your device’s size, you can rest assured it’s safe and secure in this Wall Box. Modern and fuss-free, by housing your AED in this Wall Box, you can display your unit with pride and have the knowledge that your defibrillator is easily accessible and retrievable in a cardiac emergency. The clear design alongside the bold labelling ensures that bystanders cannot mistake the contents of the Wall Box for anything other than a life-saving defibrillator. To hang your Wall Box, simply choose a centralised location in your area to hang the box on and use the provided matte fixings to install the box. After this, simply insert your AED into place and you’re all set. This particular option is larger than the original, allowing you to effectively house larger AEDs on the market, such as the Powerheart G5 or the ZOLL AEDs. You can rest assured that the sturdiness of the Perspex will ensure that your AED is both safe and secure, prior to use and can easily be retrieved in an emergency as there’s no cabinet doors or key codes to insert. If you require more information about the AED Armor Wall Box, simply direct any questions you may have at to the AED Armor team. Get in touch by calling 0333 678 0246 and one of our advisors will happily assist you in finding the right storage solution to suit your needs.